Ok...I promised to keep the same centerpiece and just add a few different elements, and I stuck to it! My goal has been to keep the rustic, natural elements of the greenery, grape vine and berries and mix them with the finer elements of the china, flatware and glassware. I exchanged the rattan chargers for silver, and replaced the "Winter Wonderland" dinnerware with the Christopher Radko "Holiday Celebrations" in the Christmas Tree pattern. This is my favorite of the Christmas tree patterns by far. 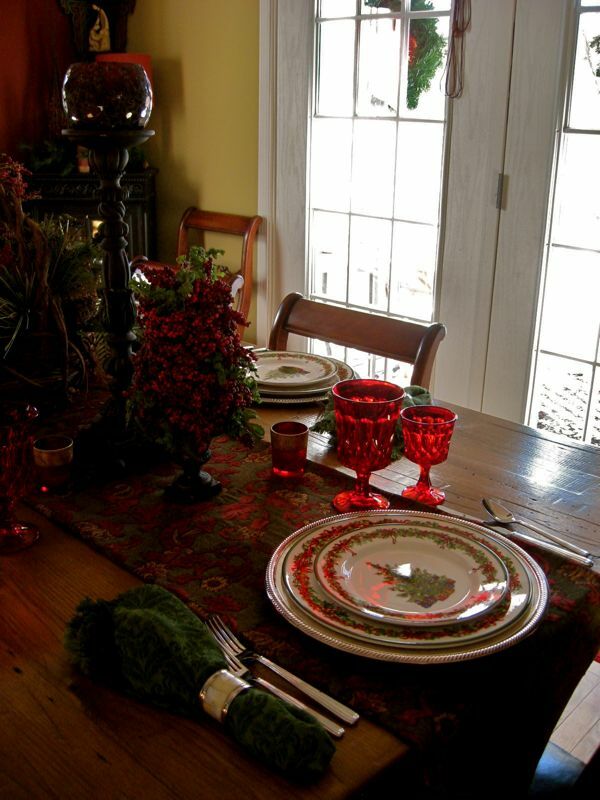 I kept the April Cornell "Poet Jacquard" napkin in forest green and the Noritake "Perspective" ruby glassware. I also kept the Mikasa "Italian Countryside" flatware. We have enjoyed several family meals here as we have been here for three days enjoying the snow and extreme cold! I have exchanged the green napkins for red, and those worked just as nicely. I do exchange the basket of greenery for the candle holder on the breakfast bar when we eat so we can all talk more freely. Thanks so much for stopping by! 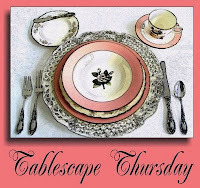 I'll be joining Susan at "Between Naps on the Porch" for "Tablescape Thursday" so please go by there and see beautiful tables! Enjoy the season and remember what all the celebration is about...Christ. Just so beautiful and festive are the tablesettings you showed us. I love the silver chargers and napkin rings. 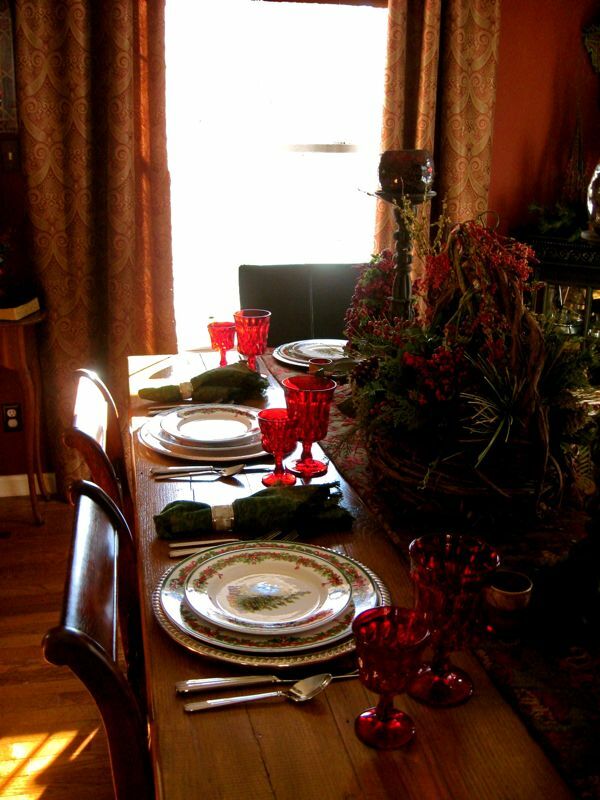 The Christopher Radko dinnerware set is so inviting.Thank you for sharing your home with us. Take care and be safe with the snow and early severe weather weather you have now. Emelia. Hi Anita, Thank you sharing another beautiful Christmas table for us. You are so talented. 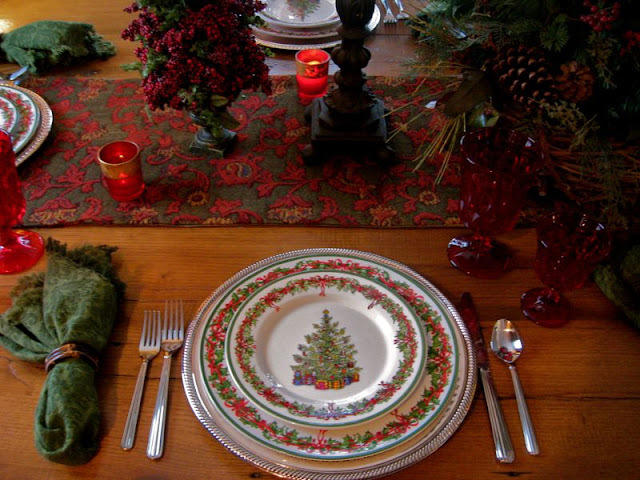 I love the tree pattern and your silver chargers and napkin rings. The red touches are also pretty. Hope ypur family is safe with all your early snowfall and severe winter (almost!) weather.Take care and God Bless, Emelia. I love your tablescape. Your china is so pretty. I love the whole table it is just gorgeous. Beautiful! That Christopher Radko dinnerware is so pretty. I have keep thinking I may buy some plates but haven't. Love how the changes are easy and change it up. It's just beautiful Anita and, oh my, look at all that snow! I really loved your berry topiaries and how natural they look. Just lovely! I love it with the changes just as much as I loved last week. 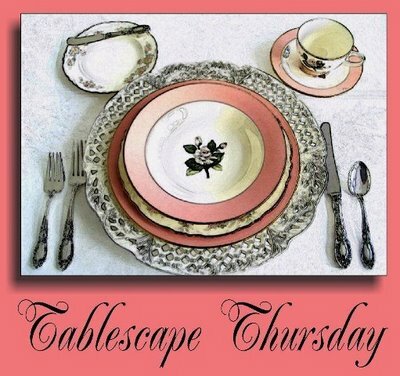 My favorite thing about your tablescaping is that you will show different options with some uniform element like a centerpiece or dishes, and they all always look unique and lovely. I have decided that if my table were as pretty as yours, I would never put a tablecloth on it. There's something about the rich grain on yours that I like. Beautiful Anita! I love the Christopher Radko plates. Your setting looks so pretty. Are you using a silver platter under those plates? Wow! I just love your setting with the snow in the background. Love the red goblets and your centerpiece is gorgeous even if you do have to move it for dinner. Great scape! Everything about your table is so warm and inviting. I love the rich color of the wood paired with the reds and greens. Those napkins in the first or second photo (green) are gorgeous! 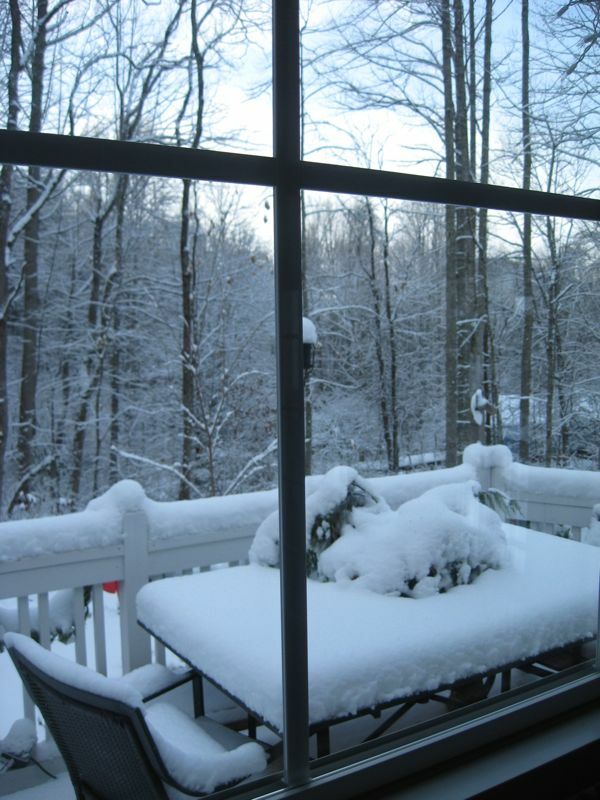 I could sit at that table and look out the window to the snow covered lawn for a looooong time. It's magical! That's such a great photo! Love the dinnerwear and your napkin rings and chargers. What a beautiful tablescape! This is so beautiful! 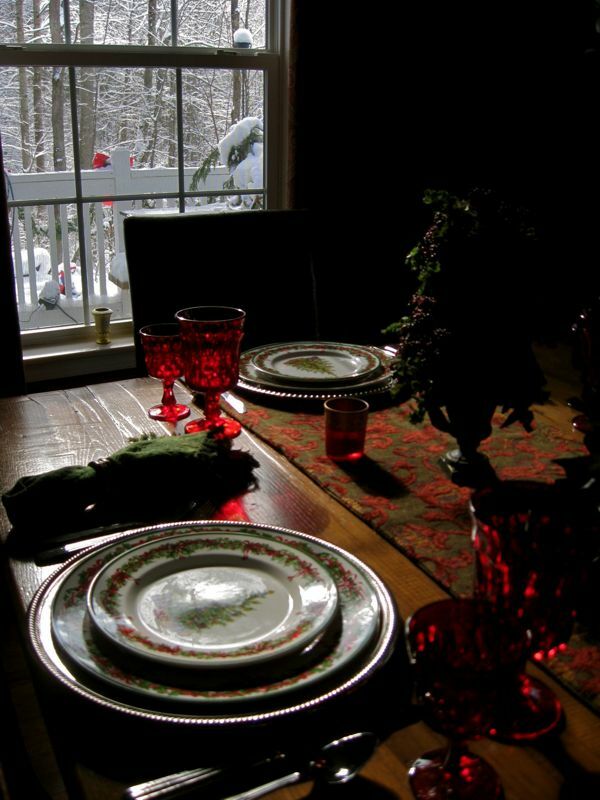 I love seeing the snow from your darkened dining room. Wonderful table and views! I love the Christopher Radko plates. Aren't they fun? You set a warm and beautiful table with them. (I have these plates also). Love your silver chargers.. Perfect. I love how rustic always goes so well with silver. Your table is beautiful. So, so pretty! 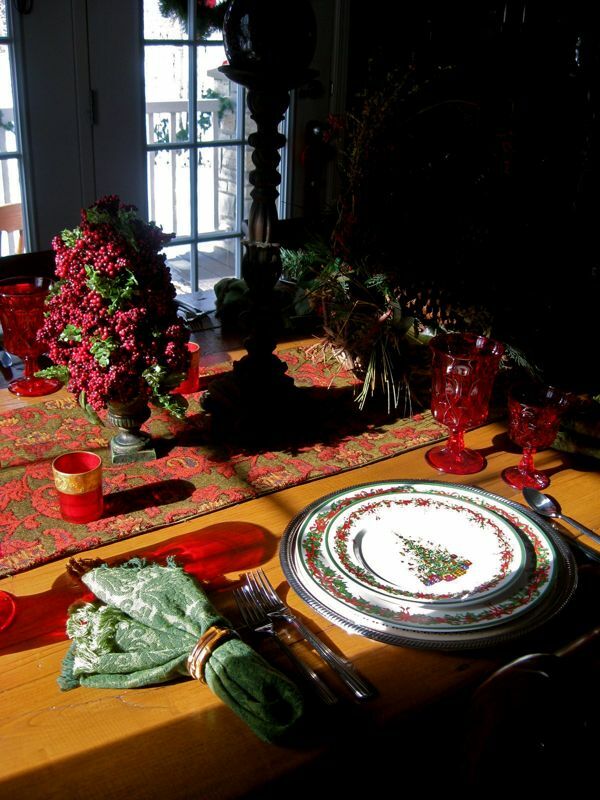 What a beautiful holiday table! Everything - EXCEPT THE SNOW!!! - looks fantastic! :-) You totally met your goal of successfully mixing the elegant with the rustic! 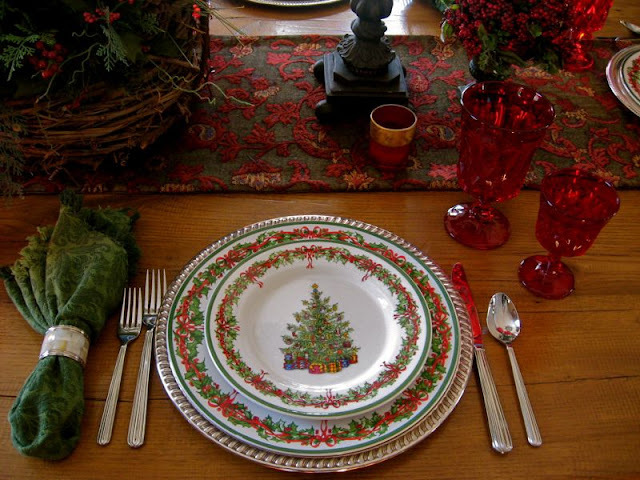 What beautiful Christmas china! The green napkins set it off beautifully. Your pretty red stemware looks gorgeous, especially with the sun shining through it. I've enjoyed all your snow pictures this week! So lovely! 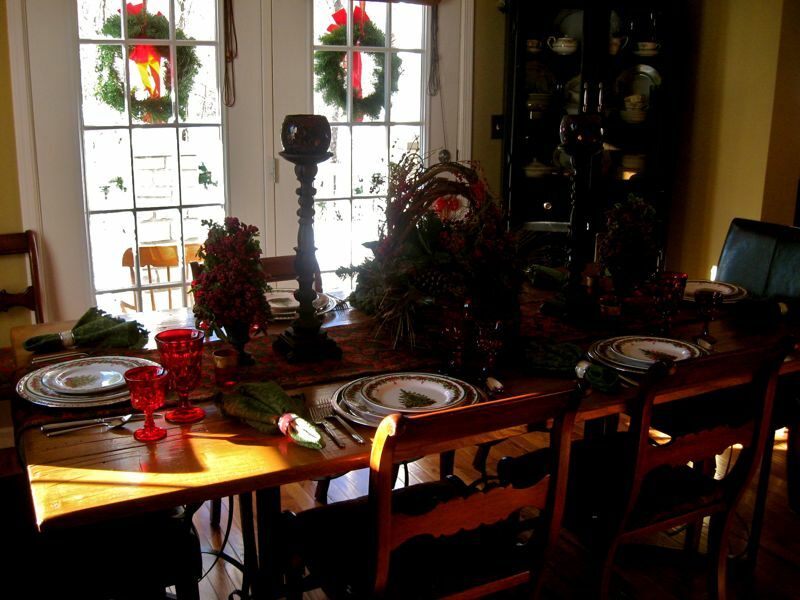 Dear Anita, thank you for sharing your lovely tablescape with us. Your china are beautiful. We have rain right now but it's going to make way for snow later. 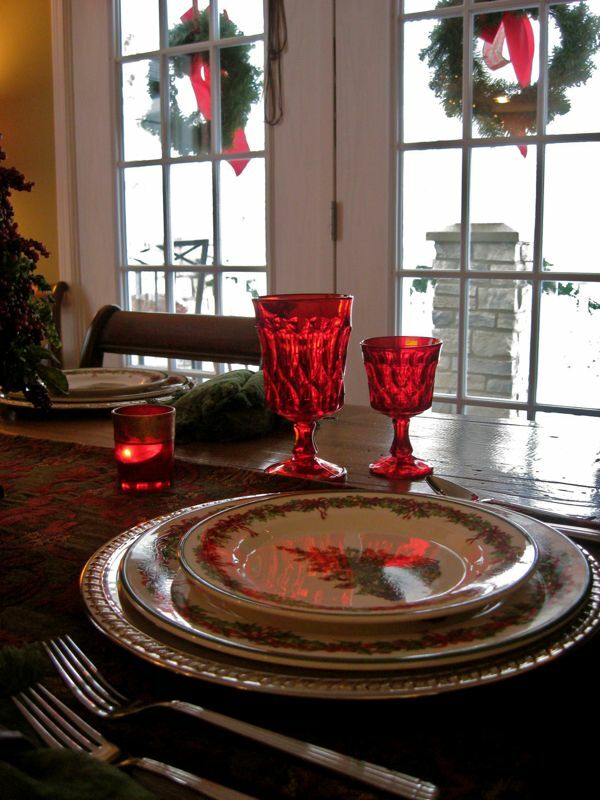 Great job with the photos of the red goblets and looking to the outside. Very professional! I really like the no tablecloth and just a runner. Everything show up so well. Gasped when i saw all the snow you have- very pretty. Enjoyed the pics of your home decked out for Christmas- I have never decorated for Christmas to the extent that you have throughtout your home- sigh!!! 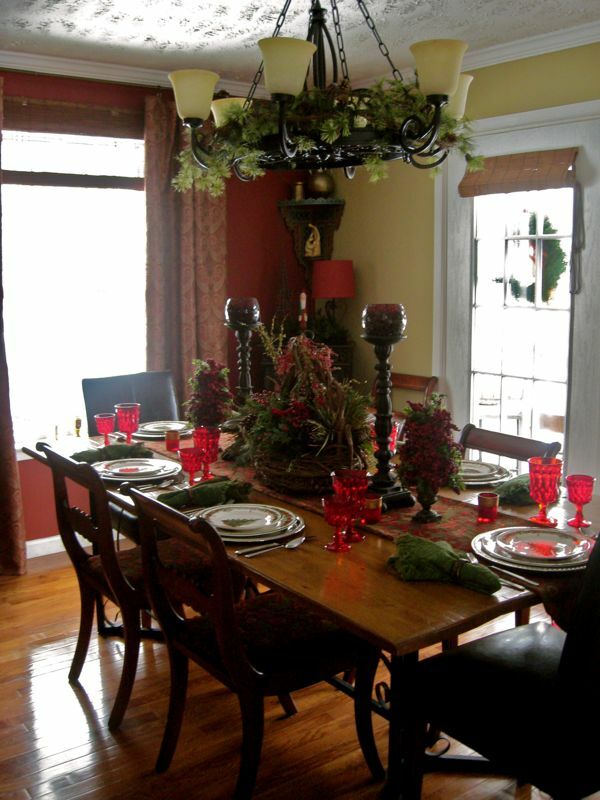 Amazing what all the touches here and there do for your home's festive spirit. Have a Merry Christmas and enjoy the snow- i am jealous- we do not get much snow here. HOHOHO Anita! Love the table..of course. I checked out your past posts and the house looks beautiful! The tree.....the piano.....your kitchen.....I can't pick a fav. As you can see from my post on my blog, I am just getting my Christmas decking started. Oh how pretty -- especially with the sunlight streaming in and lighting up your beautiful tablescape. 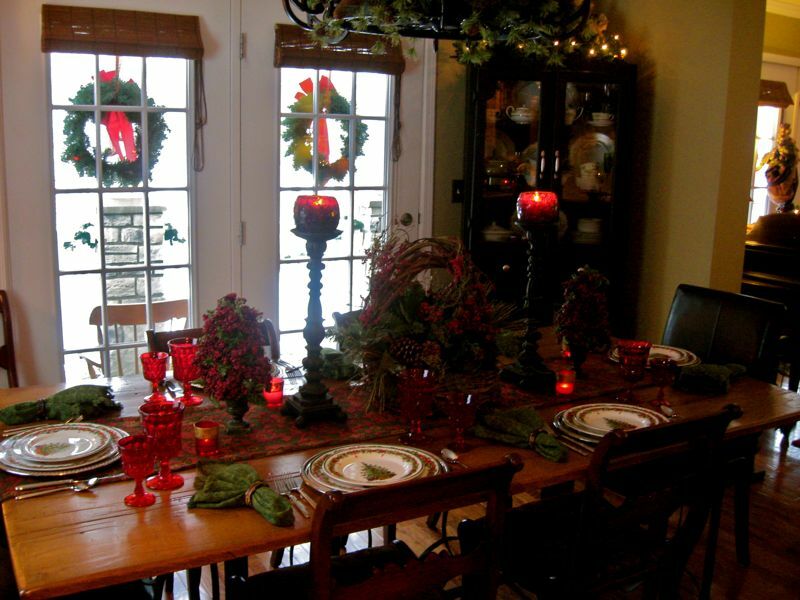 Beautiful, Anita...I love the warmth of your dining room...it always makes me smile. The CR plates look so nice with the Noritake stemware. Ooooooh, to be a lucky guest at your merry warmth!!! Lovely setting and the red goblets just set it off perfectly. I'm a huge fan of Christopher Radko and those plates are perfect. Hope you're enjoying the snow and glad your water is back. Have a wonderful weekend!